There is no ‘magic’ to any of this. The only ‘magic’ is that you as a parent have much more power than you think you have, and you need to own that and take it back. If your child is defying your authority and it makes you afraid or upset, don’t think that you’re alone—even as a behaviorist working with severely behavior disordered kids, I had to learn how to overcome this fear by making up my mind to take control of how I came across. Act calm even when you’re feeling scared. I often talk about parents being “good actors” around their kids. When your child is challenging you, trying to provoke you, or raging at you, I recommend that you keep as neutral of an expression as possible, even if on the inside you’re angry or scared. So “Fake it till you make it”—in other words, act as if you have a sense of authority or control, even if you’re not feeling it in the moment, and eventually the real thing will come to you. Deal with the problem quickly. If you’re feeling scared or upset,I also recommend that you deal with the issue quickly and then walk away. Set the limit immediately, don’t wait or let it slide. Even if you’re not going to say the “perfect” thing, or if your words don’t have the perfect effect, say something that lets your child know that you are in charge. Then, go to another room and take a deep breath and let your knees knock. Then you can start getting back in control. You may have a child who has continuously challenged you since toddlerhood, or one who has just started to defy you, seemingly out of the blue. Just why do kids challenge us in this way? A lot of it has to do with developmental stages—especially as a teen or pre-teen, your child is “individuating” from you, which means he’s separating from you and finding out who he is. This is natural and actually what kids are supposed to do, but for some children, the challenging becomes extreme. Let’s face it, when our kids challenge us, it can be scary—and we’re usually not ready for it. Your job as a parent is to set limits and let your child know what’s appropriate as he moves through the adolescent years and into adulthood. Don’t back down. Try to be consistent. 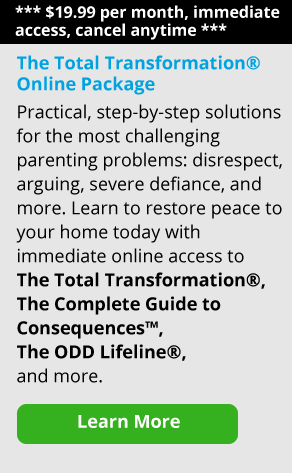 Let your child know that you aren’t afraid of upsetting him or saying “no” to his demands. Don’t get sucked into his bad behavior or what he’s saying to you, or let him try to engage you in a fight. Just state the rule, tell him what will happen if he doesn’t comply, and then walk away. And when you set that limit, stick to it. Consistency is the key, but the name of the game is follow through, follow through, follow through. Start small. If you are working to regain parental authority, I recommend that you start small. Acknowledge that you’re going to need to work at this, identify where you want to start and realize that it’s not going to be the be-all-end-all, but simply “step one.” Ask yourself, “Where is the one place I want to start being more authoritative? What do I want to start setting consequences around and following through on?” Remember that any major change starts with the first step. Many of the parents I worked with were well-meaning and loving. Most of them had been having a hard time for years setting limits with their defiant, willful, or difficult kids. Some of these parents had never really had authority in their house, while others had lost it slowly over time. The latter happens to many of us—we’re all working hard and dealing with so many things in our lives—our jobs, our relationships, our extended families, and sometimes an illness or death. Losing our sense of parental authority can happen to the best of us—but the good news is that this authority can be regained. Another important thing to realize is that there is no “magic” to any of this. The only “magic” is that you as a parent have much more power than you think you have, and you need to own that and take it back. Time and time again, I saw the parents we worked with gradually regain their parental authority. Their kids would ask me, “Hey, what did you do to my mom?” But all we did was empower parents to realize that they were in charge, not their 15-year-old kid. This brings me to my next point. Let your child know you mean business. Understand that if your child is in control, he now sees himself as being in charge. But again, that’s also very frightening for kids. As much as they enjoy that sense of power, it’s very scary to feel like they’re controlling their parents. Understand that a teen is never going to say to you, “I’m scared because you have no control over me. I’m 16 and I’m running the house through intimidation and threatening behavior.” Children, and even teens, want parents to have control and set boundaries around their behavior, but they’re not going to admit that. In the adolescent treatment center, I actually had kids say (after they’d been with us for awhile), “I was really out of control. You wouldn’t believe what I was doing. I was breaking windows and punching holes in the walls, and my mom was afraid of me. It was crazy.” Many of the teens who came to us, like Kasey, had been intimidating their mothers (and sometimes fathers) and physically threatening siblings and other members of their families. After working with us, parents were eventually able to say to their kids, “I’ve allowed this behavior to go on. This is not going to help you as an adult. 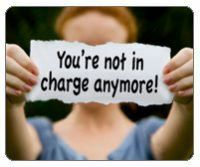 I’m taking charge now.” Sometimes that meant that they called the police when their child was destroying the house or becoming physically abusive. Regardless, they let their kids know that they would not stand for the out of control behavior any longer. Parent the child you have…I think it’s also extremely important to look at your child realistically. “Parent the child you have—not the child you wish you had,” as James always said. Maybe you thought your child would be fairly well-behaved and pleasant to be around all the time, or that she would be a good athlete or student. But if that’s not the case, you need to start seeing her for who she is. As parents, James and I worked hard to look at our son realistically and honestly, and to love him with all of his strengths and weaknesses. We assessed the struggles he was going through honestly and then worked on them together. It’s so important to check in with your child and have a realistic sense of who he is and of what he’s going through—and to know what’s reasonable to expect of him. With firm limits set, adults around them who wouldn’t back down, and consistent consequences in place, almost all the kids we worked with eventually learned how to behave appropriately. At the same time, if their parents worked hard to gain effective parenting methods and were able to take back their parental authority, they were successfully able to take charge of their family again. My message to them was the same message I have for you today: have faith, because you can always gain parenting skills. You can do this. Do not give up—just start small and keep moving forward.